Cancer cells are effectively immortal, unaffected by the processes that cause regular cells to stop replicating and die. But now we've found a protein that gives them immortality – and, just maybe, a way to switch it off. Every time normal cells reproduce, they lose a little part of the protective tip of their DNA. 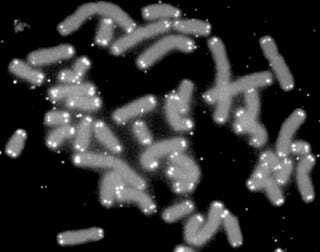 These bits are known as telomeres, and once they have become too short the cell stops reproducing and begins to die. Cancer cells, however, are able to prevent their DNA strands from losing the telomeres, which makes them effectively immortal. Researchers at Washington State University have found a way to potentially reverse this process. While the enzyme telomerase extends the length of one of the cancer cell's DNA strands, a variety of proteins are responsible for the other. The team focused on this other strand and discovered one of the specific proteins that regulates the length of the second strand, as well as how to recreate it artificially. With this crucial information in hand, they are now focused on blocking the function of the regulatory protein. If they can indeed find a way to stop the protein working properly, the benefits could be enormous. Without that protein, that DNA strand couldn't be lengthened anymore and would shorten and die like a normal cell. It would transform cancer cells from immortal killers to regular old cells, making tumors far, far easier to treat.